Happy Friday! I hope you've had a great week! We have an exciting weekend coming up with the girls' dance recital. Today, I'm sharing my weekly roundup of what I'm currently loving. I am also adding in a bonus pick that isn't fashion or style related but it's a product that I am really loving and that I think you'll love too! 1. White Kimono | I love this kimono! It's such a classic piece that can be worn all spring and summer long. 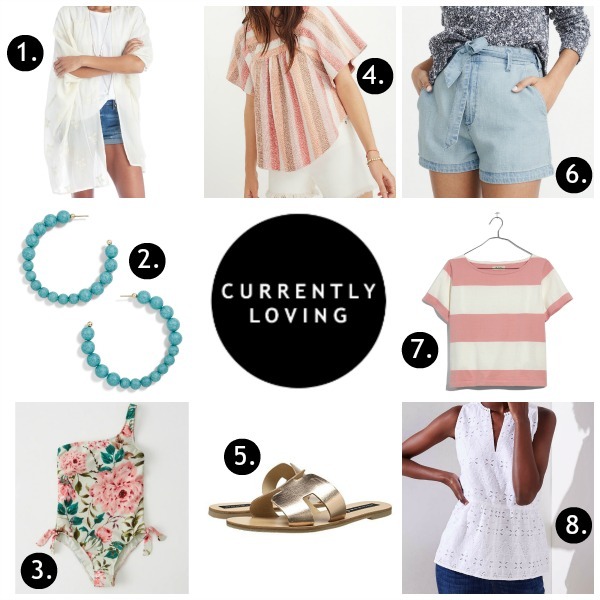 I love layering a kimono with a tank and shorts, over a dress, or wear it as a swim cover up. The eyelet detail on this one is gorgeous! 2. Earrings | I absolutely love turquoise jewels for summertime, especially earrings! When it's hot outside, I don't like to wear a lot of jewelry so a great pair of statement earrings is perfect for me. 3. Floral Swimsuit | How pretty is this swimsuit?! I also shared it yesterday's Budget Friendly One Piece Swimsuits post and it was definitely my favorite pick. The floral print, the colors, and the style are just so pretty! I need to add this one to my cart ASAP! 4. Butterfly Top | This top was love at first sight. I absolutely love this color combination and the overall style. It would be so cute with jean shorts and sandals! 5. Rose Gold Slides | Speaking of sandals, how cute are these Greece inspired slides?! You have probably seen them all over Instagram but I this rose gold pair immediately grabbed my attention. 6. Chambray Shorts | The style of these shorts is so cute! I love the tie in the front. These shorts would be great with all of your tees and tanks this summer. 7. Tee | My eye is instantly drawn to two things: the color pink and stripes. This adorable tee has both of those things! I think it would be super cute with high rise shorts or a high waisted skirt. 8. Eyelet Peplum | I shared this top in my LOFT Try On Session last week and it's back in stock plus it's currently 40% off. I found the fit to be true to size when I tried it on in store. Such a beautiful, feminine top for spring and summer! 9. Bonus Pick | And, my bonus pick of the week is deodorant believe it or not!? I'm fairly certain I have never mentioned deodorant here on the blog but I have been hunting for a natural one that I like. I have tried a few and I finally found the very best one! I have fairly sensitive skin and this deodorant didn't cause me any irritation. I have been using the Lavender and Rose scent and I love it! Thank you so much for visiting today! I hope you have a wonderful Memorial Day Weekend!